Over the weekend I was gifted a bag of cilantro and a bag of garlic mustard. I say “gifted” because I’ve recently learned that both plants have great potential to help me in my continued healing from MCS (Multiple Chemical Sensitivities). Yes, I’m holding out hope for a complete recovery. I spent part of yesterday afternoon processing the greens for pesto. I omitted the cheese usually found in pesto recipes because I try to avoid dairy. I can add it later if I desire. For the cilantro, my ingredients were olive oil, onion, garlic (2 cloves), sun flower seeds, a few dashes of Food for Thought’s Righteous Chipotle Hot Sauce (yum! ), salt and pepper. For the garlic mustard the ingredients I used were olive oil, garlic (2 cloves), sun flower seeds, salt and pepper. I squeeze a little lemon juice on top of the pesto once I have it in small jars in an effort to keep it from oxidizing and freeze any that I won’t use right away. I didn’t use a specific recipe because I used ingredients that were on hand and, well, pesto isn’t that tough. A basic recipe goes like this: 3 cups greens (basil, cilantro, arugula, garlic mustard, etc. ), 1 cup oil, 1 cup nuts (walnuts, pine nuts, pepitos, etc. ), 1 cup parmesan cheese (or romano), 2 cloves garlic, salt and pepper to taste. Rinse the greens and pick out the stuff you don’t want in your pesto; dump all ingredients in a food processor; blend until it’s a consistency you like. If you don’t have a food processor, use your blender. For those of you who don’t know what garlic mustard is, it is a pest. It is an invasive plant that is the main course at many foodie events geared toward eradicating and identifying the plant. Please look at Zester Daily for a little more information, photos and a garlic mustard pesto recipe. The entire plant is edible including the roots but you might not want to eat the stem for textural reasons. I was told by an herbalist that garlic mustard contains all the health benefits of both garlic and mustard. You can find more information concerning its nutritional benefits at Edible Wild Foods. Garlic mustard is easy to identify but if you’re thinking of harvesting your own, a word of caution: Be careful where you harvest it from since chemicals are often used in its eradication. Breaking out in a rash at the first whiff aside, there are many reasons I oppose the use of chemicals not the least of which is the fact that chemicals upset the complicated synergy of the soil. One of the reasons that this plant has popped up in whatever location it happens to be in may be because of a chemical upset in the soil. Adding more chemicals will only upset the balance even more. Also, there is a theory that invasive plants are actually growing where they are in an effort to restore the ecosystem and us. If you wish to explore this theory, please read “Invasive Plant Medicine: The Ecological Benefits and Healing Abilities of Invasives” by Tim Scott. Bon appetit, mes chers! 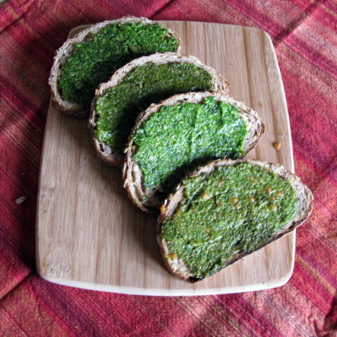 This entry was posted in Food, Green Living, Recipes and tagged Food, green living, invasive species, pesto, recipe. Bookmark the permalink. Your pesto is beautiful! I had to laugh at the Garlic Mustard, though. I just pulled a crap-ton of it out of my perennial beds. I had no idea it was edible.